Why can’t you buy a cell phone that doesn’t do too much? Why are there 175 salad dressings on the shelf at the supermarket? Why are 120 retirement plans offered in the workplace? And 50 styles of jeans at the clothing store? But Dr. Schwartz argues that conventional wisdom is wrong about choice. While defending choice as a good, he points out that it is a limited good. What’s more, the abundance of choice can confuse us or even make us miserable. He had no idea what that was, so I spent an hour trying on all these damn jeans, and I walked out of the store – truth! – with the best-fitting jeans I had ever had. I did better. All this choice made it possible for me to do better. But I felt worse. Why? … The reason I felt worse is that, with all of these options available, my expectations about how good a pair of jeans should be went up. I had very low – I had no particular expectations when they only came in one flavor. When they came in 100 flavors … one of them should’ve been perfect. And what I got was good, but it wasn’t perfect. And so I compared what I got to what I expected, and what I got was disappointing in comparison to what I expected. What are some of the consequences of an incredible number of choices in all the different areas of life? Christians who would understand the dynamics of contemporary culture can learn a good deal from Dr. Schwartz. Of course, it will require setting aside his left-leaning cultural and political comments. But his research offers important insights that we can profit from as we learn to read—to understand—contemporary culture. Or in biblical language, he is a resource for learning to read the signs of the times. 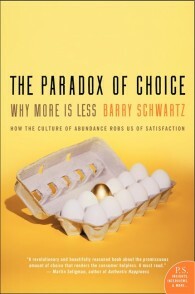 Dr. Barry Schwartz is professor of psychology at Swarthmore College and the author of The Paradox of Choice: Why More Is Less. His TED Talk, “The Paradox of Choice” (both video and transcript), is available here. If Jesus is the answer, what’s the question? But who is to limit the choices?